The first time I went to Ueno Park was last November, when autumn's touch had infused upon it the colours of red and gold. 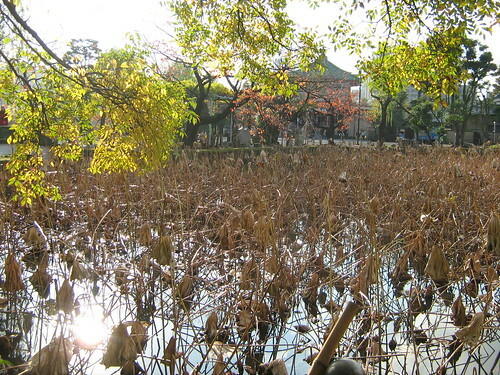 (Not to be narcissistic, but I did take some bloody good photos that time) What left the most impression then were the wilted lotuses at the Lotus Pond (part of the Shinobazu Pond). When I went back to Ueno again last Friday, the first time I've done so since winter, I was pleased by the sight of lotuses covering the entire pond. Then I walked to the Boat Pond section and saw some young couples on the rental boats. How cliched. I noted wryly, but not without a slight tinge of envy. I trudged past the three museums at Ueno Park, the Tokyo National Museum was closed, but the National Science Museum (or National Museum of Science and Nature) caught my eye. 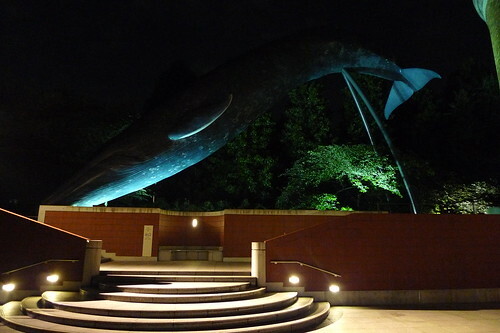 Mostly because of the blue whale replica at its exit. I wondered whether it was a life-size replica, it was pretty huge. The first and last time I saw a replica of a blue whale was at the National History Museum London. It was 1992, I was with my mom. That was a memorable trip. 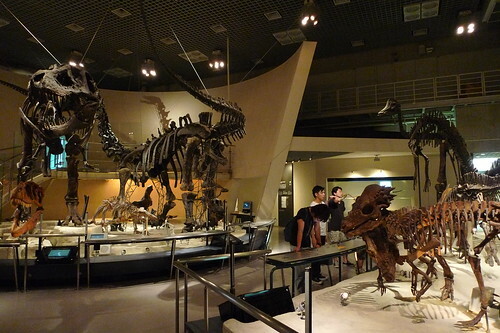 It was also the first time I saw dinosaur skeletons. Like many, I was a major dinosaur nerd then. While many childhood friends and teachers from primary school can attest to the fact that I have always wanted to become a film director, I shared a brief love affair with dinosaurs. And so, I went back to becoming the strange fat boy who wanted to become a movie director. It's like how you would love an obscure indie band that no one knows about, and all of a sudden it gets signed up by a major label and you decide to cling to your integrity by shunning the band because 'they sold out'. 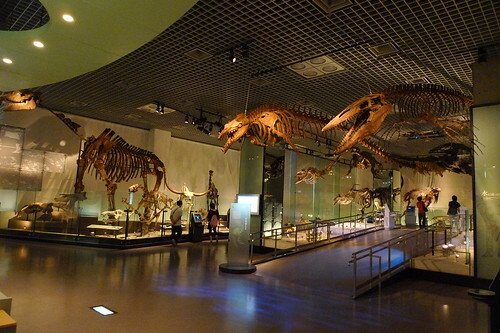 Like the blue whale, that trip in '92, was also the last time I saw dinosaur skeletons. So seeing them again at the National Science Museum felt like a trip down memory lane. The museum is divided to two buildings, one the Earth Pavilion, the other the Japanese Pavilion. 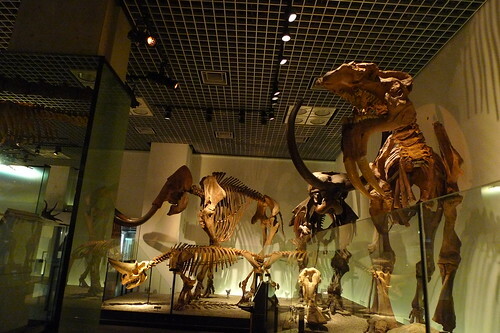 The dinosaurs were in the Earth Pavilion, so were the creatures from the age of the mammals. There were two woolly mammoth skeletons too. I think the creatures from these era's a little underrated, no one seem to love them as much as the dinosaurs. Well, there's the Ice Age films, but they threw dinosaurs into the third film, so I think that's a cop-out too, they still need the dinos to appeal to more audiences, hmph. Another film I can think of set in the same era was last year's forgettable 10,000 BC, which I went to see with irony. It obviously didn't do to prehistoric creatures what Jurassic Park did to dinosaurs. The museum was about to close when I rushed to the Japanese Pavilion to take a look. 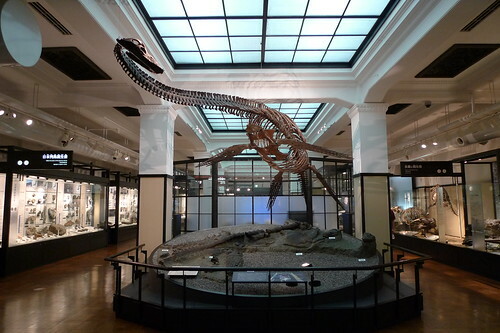 At the time the place was almost empty, save for four other visitors, who were all deaf-mute and communicated with each other via sign languages as they strolled past the exhibits, occasionally laughing. 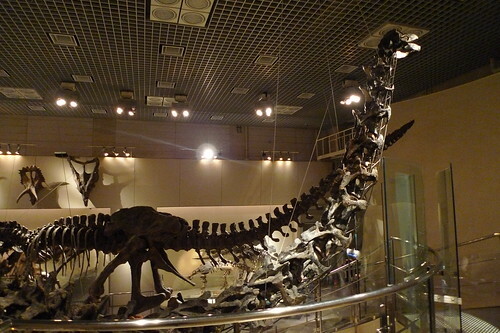 I saw the Futabasaurus, a plesiosaur (aquatic reptiles that live at the same with dinosaurs, but they are NOT dinosaurs, that's what wikipedia said). I recognized it as the one from the 1980 Doraemon movie (and its 2006 remake), NOBITA'S DINOSAUR. I guess NOBITA'S PLESIOSAUR didn't sound as catchy.